**** Chosen by Winner: Steven V.
KA-BAR has been in the process of discontinuing its Zombie series knives. 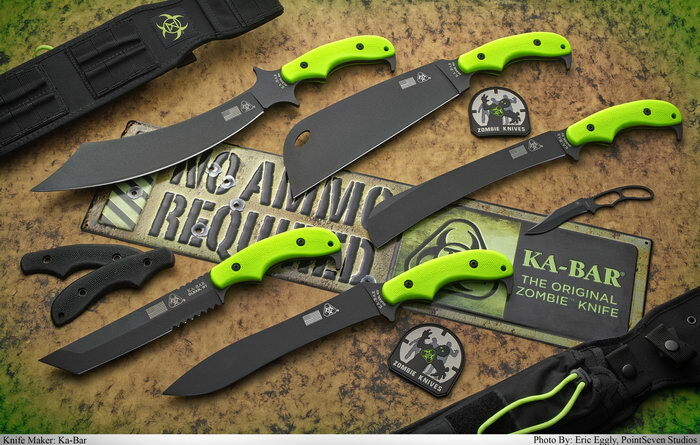 This may be your last chance to get a set of NEW Zombie Series Knives new from KA-BAR. The KA-BAR Zombie Killers Series incorporates dependable tools with a little "out there" attitude. These toxic green gripped blades aim to put your mind at ease should you ever be face to face with an undead enemy without a firearm. Of course they look cool! Of course they will clear brush and work hard tackling your day-to-day. But hey, you just never know when their true intentions may need to be put to use. Do you want to take that chance? Will you be prepared? The Zombie Killer knives are quite lightweight for their intimidating size and very comfortable in the hand due to their ergonomic handle and notched thumb rest. The razor sharp blades are formed from 1095 Cro-Van high carbon tool steel that has been black coated. The grippy toxic green GFN-PA66 handle scales are attached to the full tang with allen screws. The front of the blade is stamped with the ZK bio-hazard logo and features a lanyard hole. Included with each knife are a set of interchangeable black handles, a MOLLE nylon sheath with front stuff sack and a black ZK Acheron Skeleton Knife that has its own insert in the sheath. This set also includes the The Original Zombie Knife No Ammo Required Metal Sign. Now Made in the USA!!! We wouldn’t tell you to buy a KA-BAR knife because of its military heritage or because it’s a legend in the world of knives. We wouldn’t tell you to buy a KA-BAR because it comes from an American company with more than a century of knife-making experience. And we wouldn’t tell you to buy a KA-BAR knife because of its resistance to corrosion, tested strength, unmatched edge-holding ability and out-of-the-box razor sharp blade. Because there’s only one real reason to buy a KA-BAR. When it comes down to it and you’re all alone and your survival depends on a knife, you’re going to want a knife you can trust. A knife that won’t fail you. A knife that has proven itself time and time again. You’re going to want a KA-BAR.